SRM University has launched the School of Liberal Arts and Basic Sciences (SLABS) at its University campus in Amaravati, Andhra Pradesh. The School was inaugurated by Dr. P. Sathyanarayanan, the President of SRM University. Intended to operate as SRM University’s base for fundamental research, SLABS will offer programmes across 6 disciplines namely Physical and Natural Sciences, Arts, Humanities, Social Sciences, Business Studies and Commerce. Starting from 2018 onwards, BA, BBA, BCom and BSc courses will be offered across these disciplines in 12 subjects - Economics, English, History, Journalism, Psychology, Business Studies, Commerce, Physics, Chemistry, Mathematics, Biology and Computer Science. Each programme will be of three years duration, with the option of an additional year, at the end of which successful candidates will receive a Diploma/Certificate. The eligibility criteria of SLABS mentions that a candidate must have cleared his/her Class 12. SLABS will release its merit list on the basis of its selection criteria after the completion of the application process. 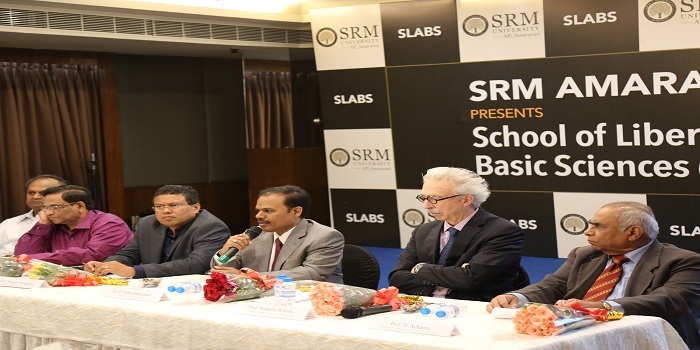 “As we launch SLABS, we are working to ensure that our undergraduate students will be the full beneficiaries of the best set of undergraduate experiences available anywhere, in the larger context of building a leading research university with aspirations to become world-class in every possible sense,” said Prof. Nicholas Dirks, the Honorary Pro-Chancellor of SRM University, Amaravati who also serves as the Chancellor Emeritus at the University of California, Berkley. “In our program, students will learn the skills of critical thinking and knowledge creation in a range of fields in the humanities, social sciences and sciences,” he added. Dr. D Narayana Rao, Pro. Vice Chancellor, SRM Amaravati shared that the multi-disciplinary focus of SLABS will ensure that the students would have both breadth as well depth of knowledge about a wide range of subjects. Also present on the occasion were Prof. Prashant Mohapatra, the Vice Provost of Graduate Education at the University of California, Davis, and Prof. Damodar Acharya, Former Chairman, AICTE, both Members of the Board of Management of SRM University. Your SRM University AP, Amaravati brochure has been successfully mailed to your registered email id .